The largest species of Tuna, the Bluefin Tuna, is a monster of a catch. With its swift swimming ability, the Bluefin is a merciless predator. Schools of prey fish often form large groups for protection, but the Bluefin Tuna forms its own U-shaped schools that torpedo toward the prey group and surround it. Description: The back of this massive Tuna species is almost black, while its sides and belly are a silvery-white. The belly has rows of sloping, whiter dots. A reddish-brown dorsal fin and short pectoral fin also distinguish this variation from other species like the Yellowfin. Size: The size of this species of fish can be overwhelming. Its massive body weighs in anywhere from 300 lbs to 1000 lbs. The high oil content of its red flesh makes it more conducive to grilling and broiling than other type of preparation. Location: The Bluefin Tuna is a true prize. It can be found Gulf-wide when it migrates into the Gulf during the winter months of December and January to spawn. Once that time is over, it will be another 10 months until a good opportunity rises to hook one. 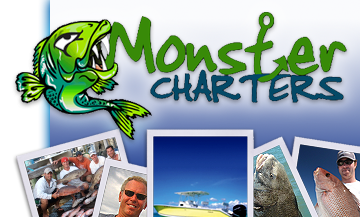 Monster Charters operates fishing excursions year round, and winter is no exception. Our seasoned captains know the right season for each fish, and we would love to help you hook a Bluefin Tuna. To reserve a spot on a winter fishing charter, contact us today!